... In with the new. Out in the open Indian Ocean. Shiny new engine in = one happy Don. Haulout for some much needed work. Looking good with a fresh coat of paint. How can I tell the story of Clair de Lune? How can one old timber sailboat cause so much emotion? When my husband Don was ten, his father Bill White started building Clair de Lune in Vancouver, Canada. She was launched before he turned sixteen and he inherited her at eighteen upon his father’s sudden passing. In the summer of 1977, aged 24, Don started a four year world circumnavigation, which I joined him in when we met on South Molle Island in Queensland. We completed the journey together in 1981. In a way, the trip was to prove that his father had built a good strong boat, but so many other valuable life lessons were experienced along the way. Clair de Lune is a timber 1929 William Atkin Erin design; launched in 1969, 10.97 metres (36 feet) in length with a 1.82m (6’) bowsprit, 3m (10’) beam, double-ended, cutter rigged with 4.5 ton (9,000 pound) of lead ballast, spruce mast, teak decks, strip-planked red cedar hull with a warm ash wood interior. She sailed us safely around the world and, from my first introduction to her, she had already woven her beauty on my heart. 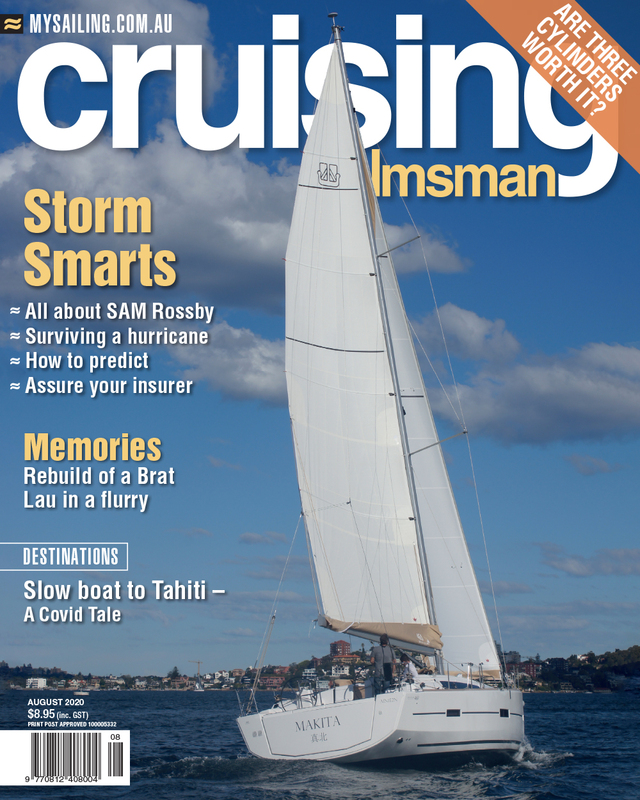 For a young Aussie girl, life in Canada and life after ocean sailing was so different: snow while we lived aboard in the Fraser River, Vancouver; ice floating past in spring; commercial salmon fishing in summer and fantastic float planes were all brand new experiences. The sunshine coast of British Columbia became our home and our first child Matthew, was born. Two years later, local economic conditions saw us making plans to emigrate back to Australia. However, a 55 per cent import duty on vessels at that time forced us to leave Clair behind. We, very reluctantly and sadly, put her up for sale. While being in Australia for the last thirty years, we busied ourselves raising a young family and tried to placate ourselves with smaller family-oriented boats. Our second son Ryan, was born and we had many day trips on a Hartley trailer sailer in Moreton Bay and various hinterland dams. All the while missing the ocean cruising life we had enjoyed on Clair. Eventually we were re-introduced to ocean sailing on board Special Effects, a fibreglass 9.8m Pearson 323, with challenging and exciting voyages to Lord Howe Island, Vanuatu and New Guinea. In the meantime, Clair had been sold again in Canada and Don’s brother Jim and wife Joni kept in touch with her third owners. In 2011 they brought her back into the family again, in partnership with friends. Having maintained and enjoyed her locally in BC waters for a while, with improvements to sails and rigging, other life happenings were now preventing them from giving her the time and care she needed and so, in 2015, they wanted to give her back to us. We found ourselves saying “yes!” It had been very hard for us to let her go all those years ago but it was encouraging to know good people had been keeping her safe and sound. We happened to be in the process of selling our home of twenty years at the time so, as crazy as it may have been, we flew to Canada with plans for a five month refit, starting with a much needed new 28 kilowatt (38 horsepower) diesel engine. Seeing Clair on her mooring after so long was a shock to us and we wondered just what we had gotten ourselves into. The northern hemisphere seasons had taken a toll on her: deep green algae and barnacle growth on her hull; decks blackened; sail covers splattered with bird droppings. Down below we found patches of rot on some added timber panels and in the plywood underneath the teak deck, the ancient engine corroded, a lot of oil in the bilges and mould on the ceiling. Our idea of simply replacing the engine now involved a lot of other maintenance and restoration projects. Initial dismay that this mammoth task was beyond us had however turned into resolute determination to save and love her, however long it may take. Enjoying the fine Canadian spring weather and being graciously hosted by Jim and Joni at their lovely hilltop home, we ploughed into the first tasks. The old 18kw Farymann engine took a bit of encouraging and tweaking over two days, but she eventually started for us and, though running hot at the end, carried us from her mooring on Saltspring Island to the home dock of Jim’s friends who had kindly allowed us to tie her up for a while there for easier access. There followed an exhausting few months of a multitude of jobs in the now, unseasonably hot, dry Canadian summer. We pressure washed decks, hand scrubbed mould, dismantled rotten timber in between the galley and engine space and took out all electricals and wiring, every frayed and ancient piece. By mid-June we had cut out rot from underneath the deck, applied wood preservative on the deck edging and the engine was disconnected and ready to be lifted out. Finally we got to pick up a shiny new red engine, a Kubota diesel from Gartside Marine in BC; followed by parts shopping for new wiring, running lights, stop rot products and engine oil. As well as supplies for living on board including an insulated esky cooler as a temporary fridge, blankets and bedding. The costs started adding up, especially with GST and sales tax being added on at the register, not included in the advertised prices. We received lots of admiring attention and interested questions while the engine sat in the tray of a borrowed pickup truck on the ferry run home to Saltspring Island. We towed Clair five nautical miles to the Coast Guard dock on the island with brother Jim’s Boston Whaler. With invaluable help from long-time good friend Chris Acheson there was lots of physical manhandling and, as he expertly used the winch at the government dock, the ancient diesel was lifted out and hoisted on deck and then on to the dock. Surprisingly, an interested passer-by wanted it for parts. Once again the dockside crane was used to delicately lower the new engine into Clair through the main hatchway, then we were line-hauled across to the government dock to begin the installation tasks. We started measuring, designing and building new oak bearers for the engine bed and new engine blocks, again with invaluable help and patient encouragement from friend Chris and other helpers, including the expertise of enthusiastic 80 years young shipwright Ron. While at the busy dock in downtown Ganges connecting all the engine parts, we were entertained by local Thursday evening activities, especially four awesome floatplanes landing a minute apart, taxiing right past Clair, followed by twin simultaneous take-offs into the summer sky. As I watched everything unfolding, I was amazed that we were there in the middle of such a surreal life adventure. After many long, hot days of adjusting bolts, filters, blocks, oil, fuel etc., finally we were ready to crank the engine and we were ecstatic as it started first go! How good it sounded and how emotional and triumphant we felt to have this new lease of life with Clair de Lune. We motored to Tseshun Harbour on Vancouver Island for a week long haulout for keel cleaning, painting and a marine survey. We appreciated the invaluable help from nephew Chris with the multitude of scraping, sanding and repairing tasks. Returning to Salt Spring Island with a now smooth hull, she flew along through the water at a good speed. We had discovered however that the bowsprit and anchor box were badly rotted out and yet another major repair was looming before us. A bit of an exhaustion meltdown followed, as our pace had been frenetic throughout the busy weeks. We were once again very appreciative of the hospitality from friends Chris and Lee Anne, who graciously assisted us with the use of their dock, shed, tools and home to live in as we sourced timber and machined a new Douglas fir bowsprit and anchor box for the foredeck. We also oiled the teak decks as protection until we could fully repair them in the future. Finally Clair was looking beautiful and we were ready for a sail. There followed some much anticipated cruising time, up the coast of Vancouver Island to Powell River and the beauty of Desolation Sound.